In 1981 the United States Centre for Disease Control and Prevention published a document that reported the first case of AIDS on American soil. Medical professionals, scientists and suffers have been fighting the disease for over 30 years yet I was unaware of this report as the small start to a gigantic problem. There are millions of these tiny tales that make up the big picture. 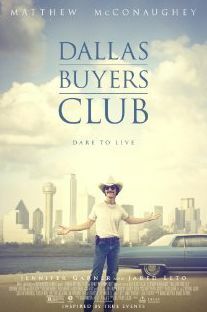 Dallas Buyers Club is one of them. A very powerful one. Dallas 1985. Ron Woodroof (Matthew McConaughey) is a loud mouthed redneck who likes to party hard. Booze, drugs and prostitutes are his vices, and homophobia and racism make up his ignorance. While being treated at hospital for a work injury, doctors (Jennifer Garner and Denis O’Hare) inform Woodroof that he’s HIV positive and will die in 30 days. Not content with a prescription of a trial medication called ‘AZT’ Woodroof goes in search of new ways to treat the disease. In the wilds of medical research around the world, unsanctioned by authorities, Woodroof discovers a concoction that works and imports various mixtures to America for sale through a ‘buyers club’ where a subscription is paid in return for treatment. Before getting to the conflict of Woodroof’s life, director Jean-Marc Vallée and screenwriters, Craig Borten and Melisa Wallack, get dirty in his trailer park lifestyle. Woodroof hustles people for money at professional bull riding events, acts like the Shakespeare of derogatory terms, and is forever soaked with a sickly sweat from narcotics and his undiagnosed illness. Woodroof isn’t just a run-of-the-mill scumbag, he’s a fast talking, no nonsense, charismatic southerner, who comes together like Borten and Wallack built a creature from the best parts of the anti-heroes of cinema. Borten and Wallack cleverly make Woodroof’s flaws a strength in the face of his diagnosis. The character refuses to take ‘no’ for an answer, which becomes especially poignant due to the portrayal of the American medical communities underestimation of HIV/AIDS, and the hesitation to exercise a plan to treat the disease. It’s always unnerving when filmmakers demonise doctors and scientists in the face of a monumental challenge, but Vallée manages to capture the uncertainty perfectly. The errors made in prolonging effective treatments by medical officials is the closest Dallas Buyers Club gets to anointing a group of bad guys, and the death toll is large, but you do get a feeling of the utter free fall of apprehension the entire world was in during the late 1980s. Vallée, Borten and Wallack present Woodroof as the one man unafraid to speak the truth about AIDS and you see the small seeds of change sown. Vallée isn’t begging you to be inspired or enlightened, the handling of the material ensures the impact of Woodroof’s experience will leave an impression in a sea of stories about AIDS. The narrative does bloat toward the end like a balloon that refuses to burst. Subplots involving Garner’s character being shunned by her medical peers, financial woes of the buyers club and the politics of the medication AZT sadly detract from Woodroof’s tale. McConaughey reinvents himself yet again in the cowboy boots of Woodroof, but the actor devolves every aspect of his powerhouse charm as well as his body. Skin clings to his delicate frame turning once chiseled cheekbones into dark caverns. McConaughey’s physical transformation is incredible and you get every sense of a man being eaten alive by a disease. While Woodroof’s body is deteriorating, McConaughey makes sure the character’s spirit remains intact. A lot of bull riding imagery is used throughout the film and McConaughey imbues his character with the essence of a rider who refuses to release their grip. It’s becoming hard to pick McConaughey’s best performance because he outdoes himself with each new film and Dallas Buyers Club cements him as one of the greatest actors of his generation. A majority of the perspective of the homosexual community gripped by AIDS is told via a transvestite played by Jared Leto who embodies the hopelessness of a generation of homosexuals left to die because their cries for help went unheard. Leto is fantastic and the character is Woodroof’s conscience and emotional pull into the cause outside of the financial gain of the buyers club. Leto’s performance is wonderfully indulgent in the cross dressing department, but there is heartbreak when the character reverts to the straight projection of himself in order to gain favour with his disapproving father. It’s tricky standing in the shadow of McConaughey but Leto shines bright. The difficulty curve of presenting a story set during the ravage of the AIDS in the 1980s is steep because there are a vast number of stories to tell, and each voice matters. Dallas Buyers Club manages to contain the scope of a larger issue and refine it through the steps of one man who made a difference. Good review Cameron. If anything, this movie is well worth the watch, solely for the performances from both Leto and McConaughey. Both are great and clearly know how to work with sub-par material. great review, really can’t wait to see this!